Snack Girl is getting old and her eyes are going. Actually, I blame this screen I am sitting in front of for my inability to read labels. How many times do I see someone squinting at the label of a food product? Sheesh, could they make the print any smaller? Something I have noticed lately at the grocery store that has infuriated me is the sneaking in of artificial sweeteners, particularly sucralose. I purposely avoid them at all costs and recently attempted to buy Swiss Miss hot chocolate (regular, not labeled as diet/low sugar at all), and realized that the ingredient list included sucralose. Of course I realize this type of hot chocolate is not a healthy choice, but the last thing I expected in full-fat full-sugar hot chocolate mix is an artificial sweetener! Since then I've noticed other products that consumers would have no reason to suspect randomly have sucralose in them. These are not products that are marketed as diet or low/reduced sugar and do not have any indication of this ingredient on the rest of the package. I'm all for the idea of "buyer beware" but this is becoming absurd. Yes, it is infuriating! I wrote about sucralose in a Nesquick Milk Shake because I was so surprised that it was an ingredient. It is marketed to children and I thought all it needed was sugar and milk. Someone at Nestle decided that it needed sucralose as well, perhaps to make it sweeter. Buy a trench coat, magnifying glass, and cool hat. Examine all the labels of all of the processed food that you buy. Shop at Whole Foods where they won’t sell food with sucralose or artificial colors as ingredients. This the label of a Pumpkin Spice Bagel from Thomas that was sent to me for review. Ummmm, why does Thomas need Yellow #5 and Yellow #6 in the bagel. Didn’t they add bright orange pumpkin to it? What is artificial color doing in a bagel? Again, I find this infuriating. It’s not that I am against including artificial colors but I expect them to be in Lucky Charms and not a bagel. How do you deal with unexpected ingredients in food? Have you figured out a way to avoid them? What Is This Ingredient Doing In My Stonyfield Yogurt? Lisa- I think you've highlighted the critical concept here: we should never assume that we know what's in a product (even if it's something we just bought the week before! ); we ALWAYS need to read the labels to see what kind of garbage is trying to be sneaked-in on us. Thanks, as always, for keeping a watch on and reminding us of this important idea. 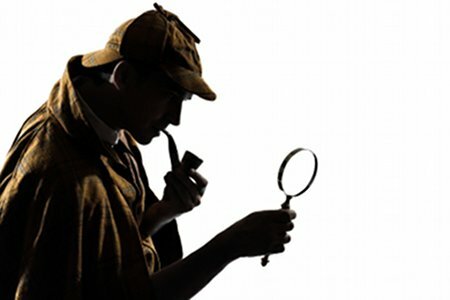 And I'd argue that there's nothing wrong with using a magnifying glass (or something like this: http://www.scientificsonline.com/fresnel-lens-magnifier.html)! I don't think any of us should let vanity result in our eating garbage! Check out how many products have propylene glycol. It's used as a sweetener and humectant. It's anti freeze! Hey snack girl, when you're talking of hidden ingredients... Get this one. My friend has celiac disease so cannot eat onions (garlic is ok though, oddly enough). Anyway, he was always in discomfort after a timmies breakfast and so asked if the hash browns had onions. The reply was surprising. 'No'. The hash browns don't BUT the EGGS do have onions! Who would have thought it!!! It's sad that we even have to worry about all the extra ingredients that they put in items that really have no business being there. I no longer buy any baked goods anymore. If I don't make it I don't eat it. Using a lot of snack girl recipes. Trying to stay away from all pre-made items. I was taught that such aloes, unlike the "artificial" substitutes, is a natural sugar derivative which has no side effects. What is it about this derivative you don't like? I quit artificial sweeteners this year. I thought all I had to do was quit diet soda and that packet of splenda going into my coffee. I have now learned it's in everything and have to read labels. Its the only way to keep away from the stuff. I am starting to see it in bread too. Its lurking everywhere and it sneaks up on me everytime I get lazy about reading a label. Thanks for this article! Years ago Cheerios had coloring added. Many consumers (mothers!) kept writing to them to complain and they finally took it out. Not sure what they contain now. I have noticed this sneakiness as well. What is bad about the adding of artificial sweeteners is really is that some people could have reactions to the artificial sweetener. I look for ingredients with "ol" as the last two letters which indicates sugar alcohols….In some cases these "ol" act as really great laxatives. It infuriates me that these products say "all natural" and so one gets fooled. I usually can taste the sugar alcohol & I do not having to take hours to read every label. It is bad enough that I have to really watch the sodium because husband is on restricted sodium diet-CHF. The addition of these sweeteners are a really bad idea. I wonder why there being added . Who knows about these aloes & probably most won't get a reaction, but some surely will. As a registered dietitian, I should be reading labels all the time, but I get lazy about it too sometimes, so thank you for this article. It is a good reminder to work on the purity of my diet. I do have a question though on the sugar in the bagel. A bagel has wheat in it, which is a carbohydrate and would typically mean there would be a small amount of sugar in it naturally. The total carbohydrate count is primarily made up of sugars, fibers & starches. This is similar to the lactose (milk sugar) in milk, which people often confuse as added sugar. So are you referring to 10 grams of added sugar in the bagel? If so, I agree, WOW! Not only do you need to read labels, you need to keep reading labels! You can't expect that because a certain brand you bought last week was okay, that it's going to be the same this week. Companies are constantly changing their formulas. As a vegetarian who doesn't do artificial ingredients, I always, ALWAYS read labels. You never know what's going to have gelatin or Red #5 in it. Unless you grew it yourself, which is also a good idea. I learned my lesson about foods labeled "no sugar added." I was fooled into thinking these peach cups were flavored with it's own natural juices but nope loaded with artificial sugars! Use your dollar to vote for the products you believe are worth buying. any ingredients I don't like, I refuse to buy the product. I either make it from scratch at home or find a brand that has better ingredients. I shop in the 'natural' section quite a lot. You really have to read every single label these days! I recently bought whole wheat cinnamon raisin swirl bread, Pepperidge Farm brand, and it has high-fructose corn syrup in it! I couldn't believe it. My solution is to make my own bread, but it's not always convenient! Ugh! It's nice to see so many people care about what's in the food. I guess the more we educate our friends and pass on this information, the more people can make a statement (by not purchasing these items with bad ingredients). Then maybe we'll have more companies listening. Maybe we all should write these companies complaining! 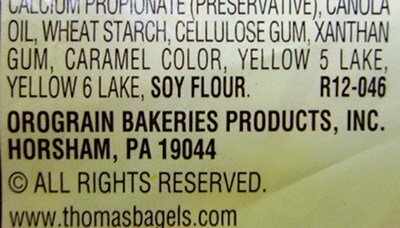 @Jennifer - so the bagel has 53 grams carbohydrates and 10 grams sugar - sugar is the third ingredient (and they also list molasses and dextrose). My guess was that most of the 10 grams is added? It just seems like a lot of sugar in a bagel. Thanks so much for your question - it has me thinking. I was reading the ingredients of a hot cocoa mix my husband had and it had trans-fat and HFCS in it. why does it need either ingredient. The angel food cake mix I was looking to buy had sodium lauryl sulfate. I don't buy shampoo with that so why would I want to eat it? I read my ingredients and drive my husband crazy while we food shop.